The EURUSD continued its bullish correction yesterday, slipped above 1.3300 and the triangle formation. This fact could be a serious threat to the major bearish outlook but consolidation movement in the end of the year is not a surprise, so I think it’s too early for a bullish reversal scenario since false breakout remains potential and we may have to wait at least until the first week 0f 2011 to see the “real direction”. However, technical bias remains bullish in nearest term testing 1.3400 – 1.3450 area. Immediate support at 1.3240. Break below that area may produce another false breakout scenario and keep the bearish scenario remains strong with 1.3170 support area as the nearest bearish target. Happy New Year! May we all have a more profitable year. The EURJPY was volatile but indecisive yesterday and now traded above 108.33 indicates potential further bullish consolidation in the last day of 2010 testing 108.85 and 109.50. Overall we are still in major bearish scenario and only a clear break above 109.50 could be a threat to the bearish outlook. On the downside, another move below 108.33 could trigger further bearish attempt testing 107.30 and keep the bearish scenario remains strong. Happy New Year! May we all have a more profitable year. The GBPJPY continued its bearish pressure yesterday, slipped below 126.10 and hit 125.48. We are in critical technical point now, where further bearish scenario is potential, targeting 124.50 area in nearest term, even lower. On the upside, immediate resistance at 126.50. Break above that area could lead us to neutral zone in nearest term as price may consolidate in the last day of 2010. Happy New Year! May we all have a more profitable year. The AUDUSD was indecisive yesterday, made a Doji on daily chart. This Doji makes me look at the other Doji on November 05, where price made a big downside correction after touched the all time high at 1.0182 as you can see on my daily chart below. Will it be the same scenario this time? No one can tell but it is potential, even with a double top bearish scenario which could create further downside scenario lower than 0.9536 from a long term outlook. Very tempting scenario don’t you think? The bias is neutral in nearest term. Clear break above 1.0182/90 could trigger further bullish momentum aiming for 1.0277 new historical high projection and may cancel the double top bearish reversal scenario. Immediate support at 1.0100. Break below that area could be an early validation of a double top bearish reversal scenario. Happy New Year! May we all have a more profitable year. The GBPUSD attempted to push lower yesterday, bottomed at 1.5366 but once again, the trend line support did a good job preventing further bearish pressure as you can see on my daily chart below, and price closed higher at 1.5428 and hit 1.5460 earlier today in Asian session. Overall there are no changes in my daily outlook where major scenario remains bearish but as long as the trend line support hold, we may see another upside attempt. Immediate support at 1.5350. Clear break below that area could be an early signal of a bearish continuation targeting 1.5000. Immediate resistance at 1.5550/75. Clear break above that area could trigger further bullish correction testing the upper line of the bearish channel. Happy New Year! May we all have a more profitable year. The USDJPY was indecisive yesterday. The bias is neutral in nearest term but still in the context of a bearish scenario after the violation of the trend line support targeting 80.00 area. Immediate resistance at 81.84 (yesterday’s high). Break above that area could trigger further upside pressure testing 82.33 which could be a threat to the bearish outlook. Happy New Year! May we all have a more profitable year. The USDCHF continued its bearish momentum yesterday, bottomed at 0.9342 but corrected higher earlier today in Asian session hit 0.9395. The bias is neutral in nearest term but still in the context of a major bearish scenario with new bearish target around 0.9275. Immediate resistance at 0.9440. Break above that area could trigger further upside correction testing 0.9550. Today is the last day of 2010 so watch out for potential upside consolidation move. Happy New Year! May we all have a more profitable year. In the previous review, Masoud mentioned that due to the lack of trading volume, unexpected currency movements may happen and it will be a challenge to analyze the markets. Looking at the EUR/USD chart above, we can see the low volume market conditions being played out on the chart. 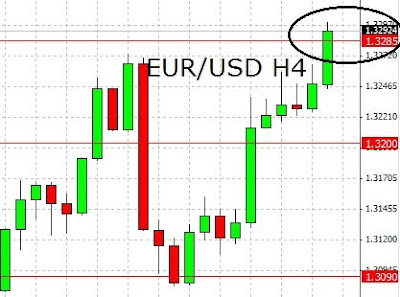 The EURUSD ranges excessively as the stability from having high liquidity is missing. The US Unemployment Claims came out much better than expected. Clocking in below 400k, traders are optimistic that the employment market may be stabilizing. A stable employment market will increase consumer spending and hence lead to a growing economy. Moments ago the US Pending Home Sales came out better than expected and this will probably add on to the market’s positivity toward the US. Compared to the problems plaguing the Euro Zone, this is probably more welcoming. Having said so, i always mention that the US faces a big debt and hence be careful of complications arising from it. As we move into New Year’s Eve and the New Year, expect even lower liquidity. Do plan your trades well and consider all risks. Over trading is a forex mistake. The EURUSD made a convincing bullish correction yesterday, topped at 1.3237 and hit 1.3258 earlier today in Asian session. If you look at the daily chart, it’s the first convincing bullish candle since December 13 and so far I think it’s a normal correction and major scenario remains bearish with 1.3000 – 1.2900 support area to be tested. On h4 chart below we can see price is moving in triangle formation indicates consolidation. The bias is bullish in nearest term testing 1.3300 and the upper line of the triangle. A clear break above the triangle could be a technical threat to the bearish outlook, but note that false breakout remains highly potential. Immediate support at 1.3200 – 1.3170. A clear break below that area could trigger further bearish pressure re-testing 1.3100 – 1.3060 strong support area. The EURJPY didn’t make significant movement yesterday. The bias is neutral in nearest term with potential range between 108.33 – 107.30 but overall we are still in major bearish outlook. Break above 108.33 could trigger further upside consolidation testing 108.85 – 109.50 resistance area. On the other hand, break below 107.30 could trigger further bearish continuation targeting 106.25. The GBPJPY was indecisive yesterday, made a Doji on daily chart. The bias is neutral in nearest term but we are still in a major strong bearish outlook. On daily chart below we can see price is now testing a crucial support around 126.50/10. Technically, from a broader outlook, there are two possibilities in this kind of situation. First, if this support area hold, strong upside pullback could take place, even a potential starting point for a bullish reversal scenario. Second, bearish scenario would continue if price able to make a clear break below that support area at least targeting 125.30 even much lower. Immediate resistance at 127.05. Break above that area could trigger further bullish pullback testing 127.50/80 resistance area. The AUDUSD hit 1.0182 yesterday and touched 1.0196 earlier today in Asian session. The bias remains bullish in nearest term aiming for new historical highs. The nearest is around 1.0277 according to daily Fibonacci extension calculation. If you remember yesterday I said that I am interested in anticipating a big bearish reversal scenario. I still do, as the risk reward ratio is very good. As you can see on daily chart below, looks like price is making a Gravestone Doji. This candle is not complete yet, so actually we don’t have a Gravestone Doji yet. Of course there are several possibilities of what kind of candle formation we will have today, but if we do have a Gravestone Doji, it’s a good signal of a bearish reversal scenario with big downside target. Immediate support at 1.0130. We may not have the Gravestone Doji if break below that area testing 1.0087 – 1.000, but psychologically, a big downside correction after touched all time high remains potential regardless of what kind of daily candle we have.